Text messaging rates vary by phone: Nokia 1100, 2600, 3390 & Motorola V170, and C155 are 18 seconds/msg sent and FREE to receive. Nokia 5100, 1221, 2285, 2126 & Motorola C343, V60, and 120 are 30 seconds/msg sent and received. 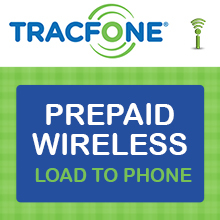 Tracfone number is required to be provided in the shopping cart, and minutes will be directly loaded to the provided Tracfone number. We will be calling Tracfone IVR or refilling it through their website to load the pin for you so please give us at most 1 hour to load it during our business hours. If you ordered outside of business hours, we will load it for you on the first hour that we open. Due to the manual nature of this product, this is not covered in our Instant Delivery Guarantee.